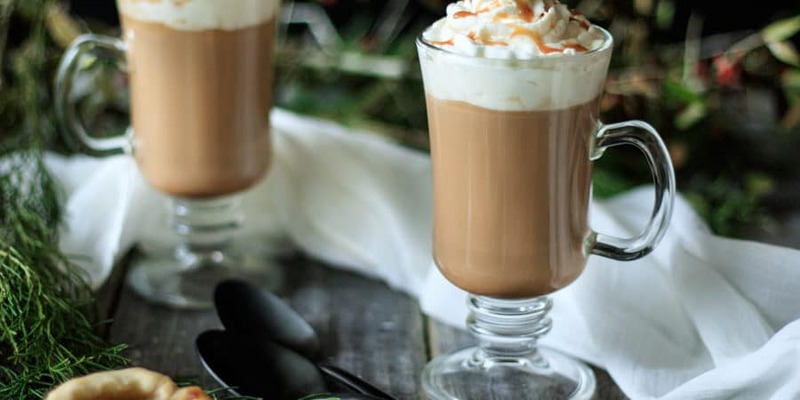 This luscious combination of creamy caramel, rich chocolate, and whipped cream make this Starbucks copycat recipe a family favorite. 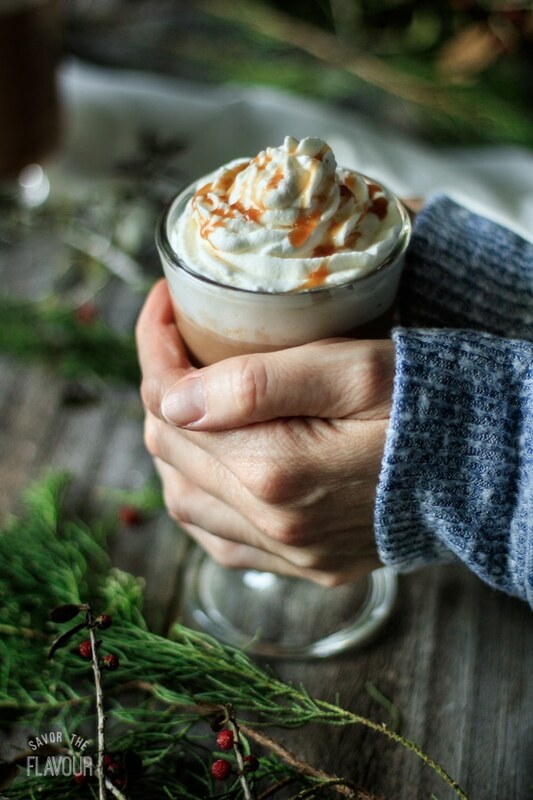 Relax at home with a cozy salted caramel mocha. In the past few months, I’ve been doing a series of copycat Starbucks coffee drinks. Starting with the pumpkin spice latte and peppermint mocha, I’m now on the salted caramel mocha. Out of all the ones I’ve made so far, our family definitely enjoys the salted caramel mocha the best! I encourage you to make this amazing drink as soon as you can. It tastes almost identical to the Starbucks one, and is actually healthier. No artificial colors or flavors are in this homemade version! Enjoy the taste of Starbucks from the comfort of your home with these copycat recipes. Pumpkin Spice Latte: this rich and creamy latte is really easy to make–no espresso needed! 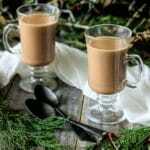 Peppermint Mocha: this Christmas coffee drink has a deep chocolate flavor and hint of peppermint. 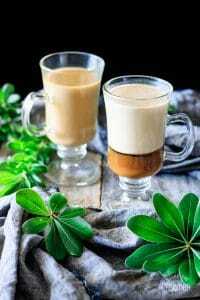 Smoked Butterscotch Latte: this sophisticated latte takes just a few ingredients to make. 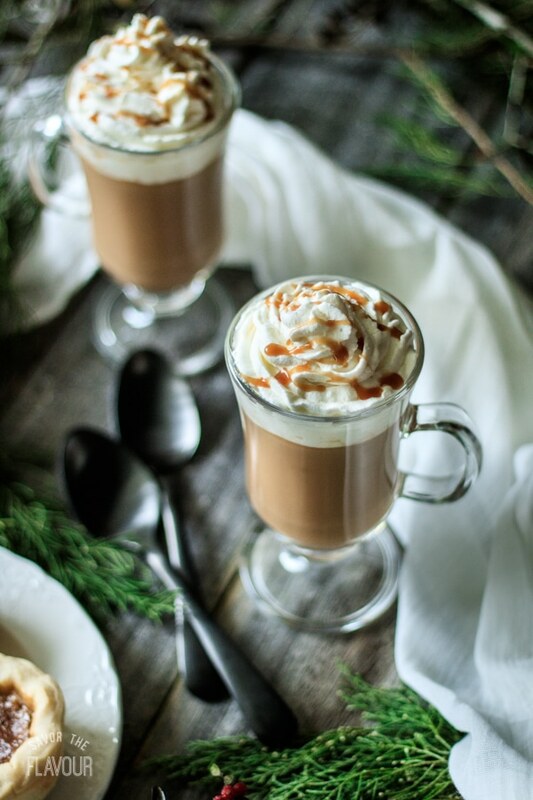 Share your thoughts on this salted caramel mocha recipe in the comments below. We’d love to hear how you liked it! Measure out the butter and cream before you start making the caramel. Place the sugar in a heavy based, 2-quart saucepan and add the water. Put over medium-low heat and whisk until the sugar is completely dissolved. Turn up the heat to medium-high and let the mixture boil without stirring until it turns a medium amber color, about 10 minutes. Watch it very closely because it can burn in a matter of seconds. Be very careful with the caramel, as it is hotter than boiling water. Once the caramel is a good color, immediately remove it from the heat and add the butter. Whisk it into the caramel until fully combined, then add the cream and whisk until well blended. The mixture will bubble up and foam when you add the butter and cream. Stir in the salt, then let the caramel cool for a minute or two in the pan. Spoon it into a bowl and set aside, stirring occasionally as it cools. This sauce should be enough for five, 5.2 ounce mochas. Sift the cocoa powder into a small saucepan, then whisk in the heavy whipping cream until it is fully incorporated with the cocoa powder. Whisk in the milk and continue to stir until the mixture until the cocoa powder has dissolved into the milk and cream. Place the chocolate milk over medium-low heat and stir occasionally until it just starts to simmer. Remove the pan from the heat and add the chocolate chips. Whisk until they have fully melted into the chocolate milk. Pour the chocolate milk into a blender and blend for 30 seconds to 1 minute, until well blended and foamy. Set aside. This chocolate milk mixture is enough for sixteen 5.2 ounce mochas. Keep leftovers in the fridge. For one mocha, pour 2 tablespoons of caramel sauce into a mug. Add 1 tablespoon of chocolate milk, 1/3 cup of coffee, and 1/6 cup of heavy whipping cream and stir to combine. Heat the mug in the microwave on high for 20-30 seconds to soften the caramel and make it easier to dissolve. Stir well. Pour the heavy whipping cream and sugar into a medium mixing bowl and whisk with a handheld electric mixer until stiff peaks form. The cream should be stiff enough not to fall out of the bowl if it’s turned upside down, and stiff enough to hold its shape for piping. Spoon the whipped cream into a piping bag fitted with a star tip and pipe the cream on top of the mug of mocha. Pour a little caramel sauce into the corner of a plastic sandwich bag, then twist the top and snip off the corner to make a little piping bag. Pipe decorative lines of caramel sauce on top of the whipped cream and sprinkle with a little kosher salt. Serve the warm mocha. Immediately, if it’s decorated. This recipe makes extra caramel sauce and chocolate milk so you can make more than one mocha. Store both of them in the fridge until needed. If the caramel sauce hardens up a lot while you’re working, pop it into the microwave for 20 seconds on high, then stir well. This will soften up the sauce and make it a lot easier to use! The undecorated mocha will keep well in the fridge, so feel free to make it up ahead of time. Just make sure to shake or thoroughly stir the mocha and warm it up before serving. Check out our articles about making caramel sauce and whipping cream if you’d like a little more info. about these ingredients.